I think I’ve just experienced my greatest “Single Woman” win thus far! (Side note: I capitalize “Single Woman” as a half-joke. One of my good grad school buddies just went through a tough divorce and bought her first house as a single woman. She sent a picture of a portion of the house contract. The contract listed her as a “Single Woman” in caps, and she was a bit offended by it. So I’m seizing the term “Single Woman” – with caps – as my own and making it into a good thing instead of a perceived negative). 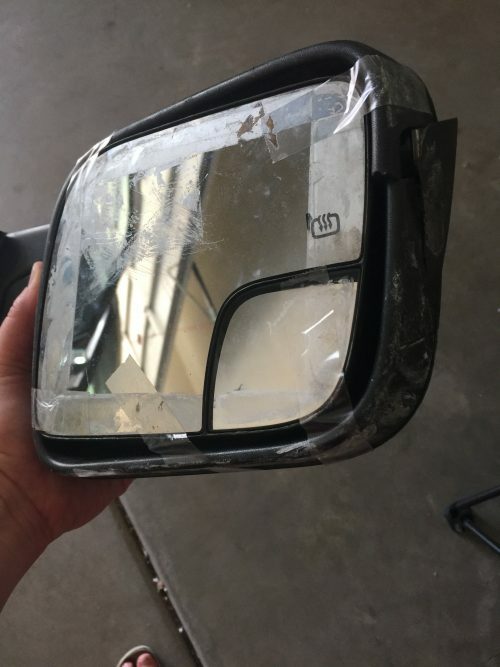 I fixed my driver’s side-view mirror that has been broken for literally 6+ months! I first wrote about it back in the summer and it had already been broken for a couple months at that point. I’d intended to get it fixed over the summer, but then our A/C went out and cost $$$, then hubs and I decided to separate, then I moved out (which cost $$$), and I mean it’s just been one thing after the next this whole time. THANK YOU to the commenter who told me to check out this YouTube video for guidance. It could not have been more perfect! 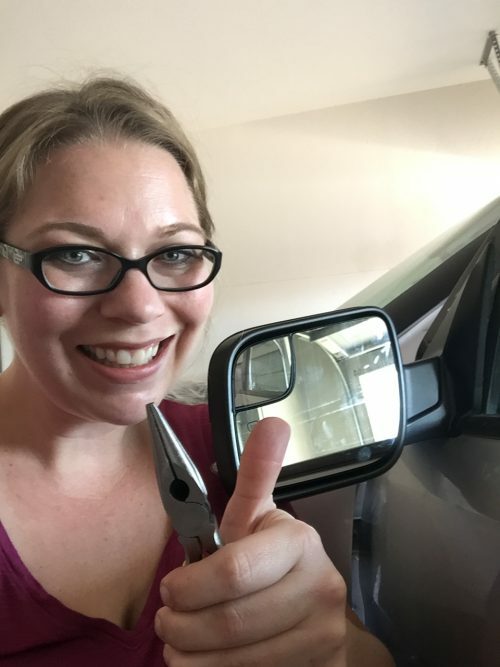 It showed me how to remove the mirror coverings, how to use a plastic ziplock bag to save the bolts from falling into the door (genius trick! ), and what to do. In full disclosure……It did take me nearly a full 3 hours. I got most of it done in about 15 minutes. It was that easy! But there’s one bolt that’s down low/covered by another plastic piece. I had a REALLY hard time accessing it. I worked and worked trying to unscrew that bolt, but I just couldn’t get a good “grip” on it with the pliers (or wrench? Whatever. I don’t know this stuff…lol) I owned. I went to Ace Hardware and bought smaller pair that would more easily be able to fit into the small crevice of a crack to access the bolt. But it STILL didn’t work. I couldn’t grip the bolt tight enough to actually loosen it. It wasn’t working. After a long time, I was feeling defeated. I had this mirror 99% removed and only one single bolt stood in my way of replacing it. How could the video make it look so easy? I watched the video again and again. I must’ve watched it near 50 times that day. Finally, it hit me. As I watched the guy effortlessly loosening the bolt I realized…..he’s accessing it from above!!! I was standing, so I was more-or-less the same height as the bolt (it was about chest-level with me). I ran inside and grabbed a chair. Ran back out to the garage and used the chair to elevate my position. Now, I was looking down at the bolt from above. I was much more easily able to slip in and I FINALLY made the concrete connection that was needed. I jimmied it a bit and finally the bolt started to loosen. 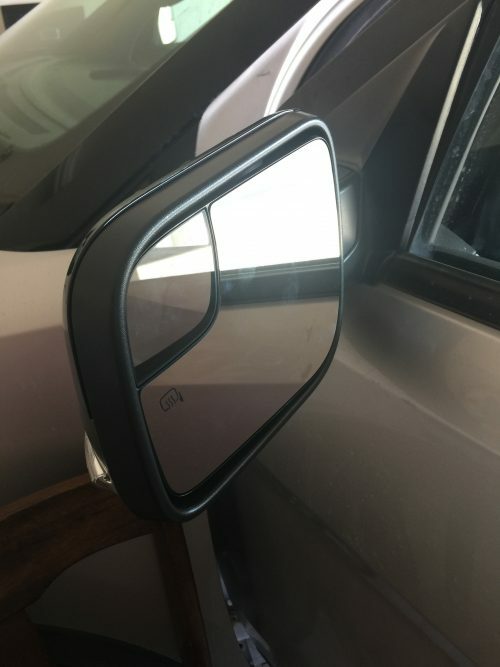 Once it was off, the entire mirror was able to easily detach. I slipped the new mirror into place and it could NOT have been any easier! There was a plug I just plugged in, lined the bolts up in place, and then re-tightened them all. It worked like a charm! Friends, it’s been a long time since I’ve felt such an overwhelming sense of accomplishment! I mean, I was riding this wave of satisfaction and pride all weekend (I’m still pretty proud writing about it now, too)! Another “win” for the Single Woman, and the frugal woman, too.